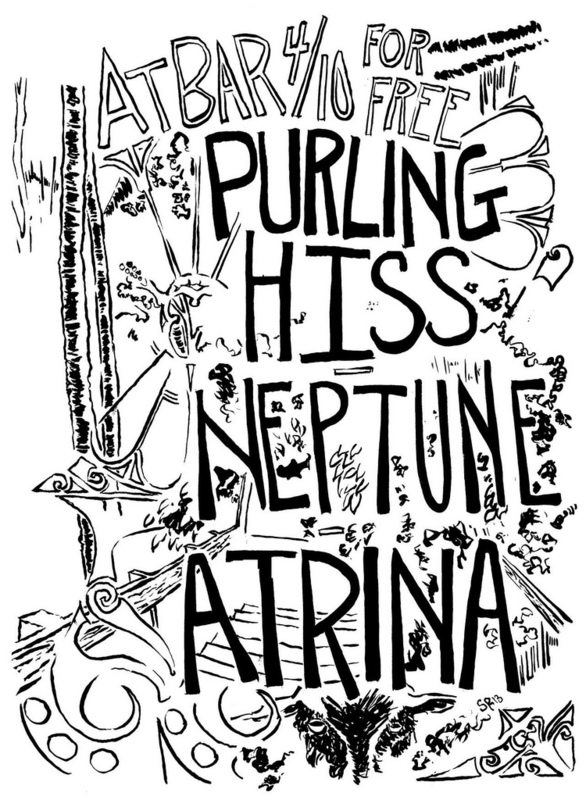 Another great free BAR show on Wednesday, featuring Purling Hiss, Neptune and one of CT's finest, Atrina! It takes balls to let Purling Hiss get in your face. Their records are a half-corroded, screaming roar of high-end guitars crushed together, obliterating vocals and even drums with their singular assault. Well, if you've got balls, get ready to swing 'em. With Water On Mars, Purling Hiss have broken out of the basement, run through the bedroom and are out in the streets, blasting one of the great guitar albums in the past couple minutes. Neptune's origins trace to 1994 as a sculpture project by Boston artist/musician Jason Sanford, who forged the band's haphazard guitars and reluctant drums from scrap steel and found objects. Seven lineups, twenty-three releases and hundreds of instruments later, the band continues to wrench its sound spatter on self-built instruments to often confounded audiences around the world. In 2007, they released Gong Lake with avant arbiter Table of the Elements, home to art heroes Tony Conrad, Rhys Chatham and Faust. Neptune has shared the stage with a variety of influential artists such as The Ex, Mission of Burma, Ut, Oneida, Lightning Bolt, The Flaming Lips, Blonde Redhead, Melt-Banana, Charles Hayward, Liars, Black Dice, James Chance & the Contortions, Gang Gang Dance, The Dresden Dolls, Six Finger Satellite, and Wolf Eyes. Sanford and longtime Neptune collaborator Mark Pearson are currently joined by musicians/instrument inventors Kevin Micka and Farhad Ebrahimi, redefining their music and creating new sounds from scratch. Propulsive percussion and sonorous electronics tangle with Sanford's microtonal string creations with a refined minimalism, adding a new chapter to the band's ever-evolving story. 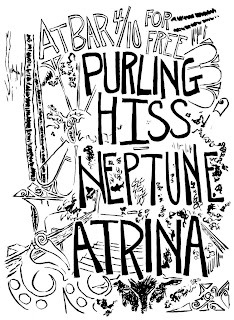 ATRINA make music that is equal parts minimalist melodicism, counterpunctal cacophony, and decibel-pushing dissonance. Angular, but accessible. Complex, yet catchy. Eclectic, and electrifying. ATRINA makes ears ring, hearts pound, and toes tap. // "it’s nice to be disarmed... Atrina force you to meet them with openness and wonderment... the feel of their music is iconic... marked by turbulent riffs in angular time signatures... lyrics evacuate the voice... leaving us with just the sound itself, a husk of something communicated... chilling, morbid, and delicious” (dan berry) // new album "In Planetary Sugar" now available via the band's bandcamp.